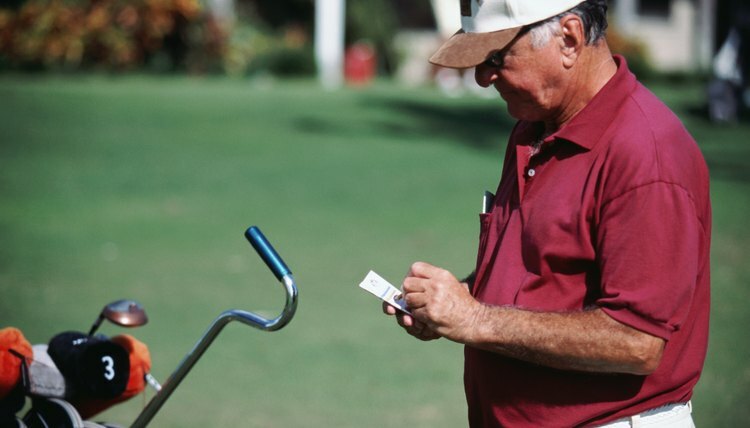 Golf scorecards are the tracking system which determines handicap strokes. Handicaps are numbers that indicate roughly how close to par a player is expected to shoot in a given round. The generally accepted method of calculating handicaps is through a method devised and implemented by the United States Golf Association, which takes into account the score, the overall difficulty of the course and its difficulty for a bogey golfer. In determining where you stand among amateur golfers in general, it helps to know what the average handicap is for both men and women. The average male golfer has a handicap of 16.1, while the average female has a handicap of 28.9. A player's handicap score is found by scoring the player's last 20 rounds individually, then averaging the 10 best and multiplying by .96. For your handicap strokes from a single round, consult the scorecard and find the course slope and rating from the tees played. Subtract the rating from the score, divide by the slope and multiply by 113. The course rating is the score that denotes what a scratch golfer would be expected to shoot on the round from those tees. The rating number is always close to par for the course. On an easier course, the number will be below par. On a more difficult course, it will be higher. The slope is equal to 100 multiplied by the slope of a line drawn through the expected scores of players of all handicap levels. The average slope is 113, meaning a scratch golfer would be expected to average 1.13 strokes better than a 1-handicap, 2.26 strokes better than a 2 handicap. Slopes over 113 mean the course is more difficult, while a slope under 113 is friendlier. Handicap is assessed by looking at the difference in players' handicap ratings and subtracting a number of strokes agreed to before the round. Some players give a stroke for every stroke difference in handicap, while others use a scaled system where a player receives, for example, 75% of the difference, rounded up. Players receive a stroke on a hole if the hole's slope index rating, found on the scorecard, is equal to or less than the number of strokes they are being given.